What man wouldn’t want Vidal Sassoon’s job? Making beautiful women even more beautiful? Could it get any better than that? “If you don’t look good, we don’t look good.” Yes indeed! 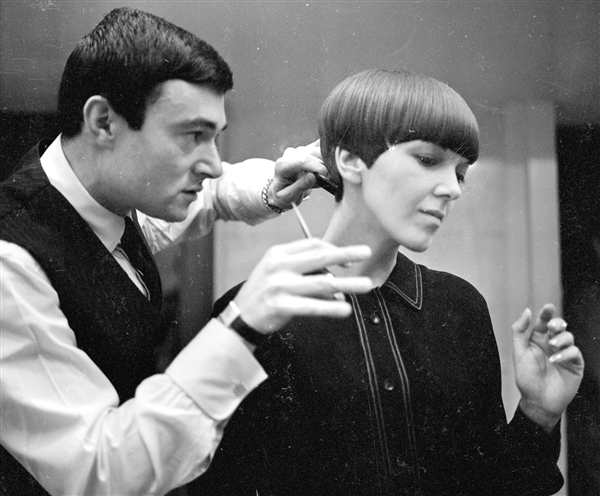 Vidal Sassoon cuts model Mary Quant’s hair, 1964. Well put, Vidal. We sensitive men always eliminate the superfluous in our dealings with lady friends, but that’s as far as we can go. Not many of us could ever hope to match your artistry. You made them feel as gorgeous as we knew they were. You did it for them. We reaped the benefits. Vidal Sassoon, dead at 84, did it the hard way. He was born in London, into a poor family of Sephardic Jewish immigrants. Part of his youth was spent in an orphanage after his father abandoned the family. His mother remarried and reclaimed Vidal when he was 12. Like many boys, he wanted to be a star athlete. But his mother insisted he apprentice to a hairdresser and become a “shampoo boy” at age 14. Sassoon also studied hard to get rid of his cockney accent, thereby to attract more upscale clients. When he wasn’t working on the ladies, he was a member of a Jewish patrol that battled homegrown British fascists in the streets of London. He also went to Israel to fight in the 1948 War of Independence, and after making his fortune he endowed the Vidal Sassoon International Center for the Study of Anti-Semitism. It was in the 1960s that his modern style bobs rocketed him to fame, with clients such as Carol Channing, Jill St. John, and the British mini-skirt model Mary Quant. Guys like Michael Caine and Peter O’Toole also liked the look he gave them. Sassoon created an international sensation in 1967 when Roman Polanski flew him to L.A. to cut Mia Farrow’s hair. Price: $5,000. Farrow wore the ‘do in Rosemary’s Baby. A chain of salons, along with sales of his haircare products, made Sassoon a very rich man. He sold his company in 1983 but stayed on for Procter & Gamble as the pitch man. He was married four times, and didn’t do much haircutting during his last few decades, except for a few select friends and clients. These included his beloved dogs, “The only Shih Tzus around with geometric haircuts,” as he put it. Rest in peace, Vidal. You’ve earned it. You are currently browsing the Veteranscribe's Blog blog archives for May, 2012.